With the help of all of you, Sonnet Saturday will now be every other Saturday to leave more room for other bloggy goodness. Since leaving the beautiful and cool weather of San Francisco, it took me a while to get used to the heat and humidity of the East Coast. Between the time change and the weather all of us were feeling quite “blah” for the past week. Yesterday morning was actually cool and I took a short walk outside with my Mom to survey the garden. 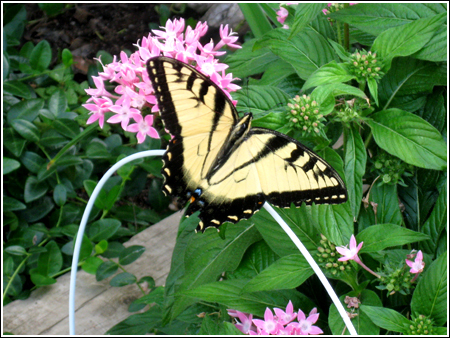 I ended up taking the following photos of a beautiful butterfly, and thought that this sonnet with its beautiful nature imagery would make a nice combination. I’ve always enjoyed when a writer compares aging to the seasons and the journey of life as a journey through nature. In this sonnet, we have the speaker discussing how “forty winters shall besiege thy brow” beauty begins to fade as the young man grows older. He becomes a tattered weed and his friend must be prepared for the fact that as he grows older he will be less handsome. The only way for him to prove that he was once beautiful and handsome is to have a child so that he may “prove his beauty by succession thine!” To see new fresh blood (that being a child), when you feel old was a way for the speaker and his friend to be able to preserve what the physical beauty they have now even though it’s superficial. Has anyone else noticed that the speaker has been completely OBSESSED with physical beauty? I was so surprised that I was able to get this close to the butterfly without her (yes, she is a she!) flying away. I was also amazed by how big she was. Even though it’s August, this is one of the first butterfly’s I’ve seen with such nice colors. I usually see the small white ones fluttering around the garden. 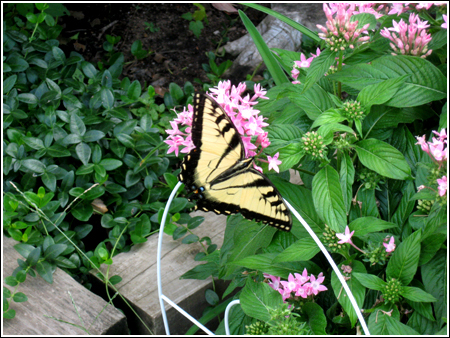 This one seems to love the morning glories and the small pink flowers in the garden. I’ll have to keep an eye out for some more. How pretty I enjoy poetry now and again, good idea. That butterfly is amazing, congrats on being about to get photos of one so close!!! I love butterflies! Great photos .. if you don’t mind me asking, what camera do you use? I haven’t seen a butterfly in years, much less one that let me get that close. As for being obsessed with physical beauty, that, unfortunately, is how a lot of people connect being old, with how you look. I remember the weather in California being really nice and cool. A lot different from central America, in Arkansas, where summers are unbearable hot with high humidity percentages and horrible heat indexes. I do not miss Arkansas weather that is for sure. Vancouvers weather is perfect. Those butterfly pictures are beautiful. I can’t even remember the last time I’ve encountered a butterfly, isn’t that sad? They are such beautiful creatures. It is really shocking how close you got without the butterfly flying off. That is a great picture of a butterfly! I love butterflies. I almost never get to see them that big. It’s amazing that it stayed there long enough for you to get some pictures of it! That’s great that you got such an awesome picture of a butterfly! How did you know it was a girl? The East coast is very hot and humid. You really only need to go about 6 hours inland from it though, and all the humidity disappears. I had a hard time adjusting from NW PA to the coastal region, too. So you’re not alone! Wow, it takes some effort and time to write a sonnet, way to go! And, what beautiful pictures of butterflies! Beautiful photos. I haven’t seen a butterfly in a really long time. I am glad to talk with you and you give me great help! Thanks for that? I am wonderring if i can contact you via email when i meet problems?